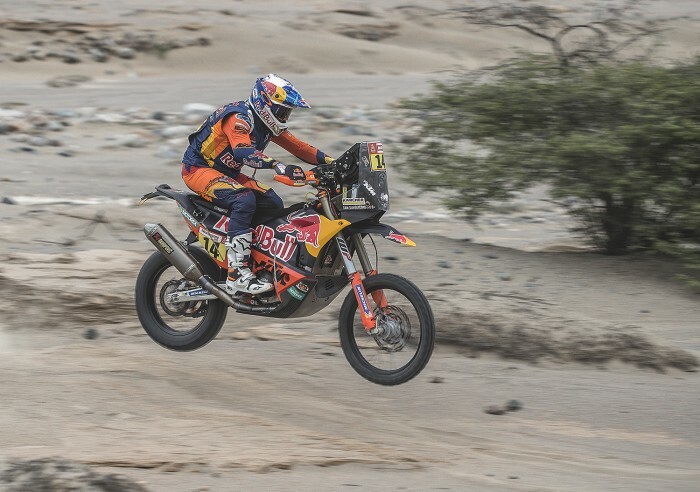 Britain’s Sam Sunderland had the unenviable task of being first rider on the sixth Dakar 2019 stage and it saw him slip from second to seventh overall. Following his win on the previous day of racing, Red Bull KTM man rider lead out from start to finish but unfortunately lost time overall to the following pack and was not helped by a damaged rear brake. “I was up against it a little today. After stopping to help Goncalves on the fifth stage I had no markers to set my pace and by winning the stage I upset my overall strategy for the race a little,” said Sunderland. “As we know, opening the stage is always a disadvantage and today, with harsh conditions and tricky navigation, it cost me a lot of time. Personally for me, I was pleased with my riding and how I managed the navigation out front, that was really encouraging.